The U.S. Department of Energy’s Sunshot Initiative announced a commitment to cut the cost of solar electricity by an additional 50 percent between 2020 and 2030. The Sunshot Initiative began in 2011 with the goal of making solar electricity cost-competitive with traditional energy sources without subsidies by 2020. 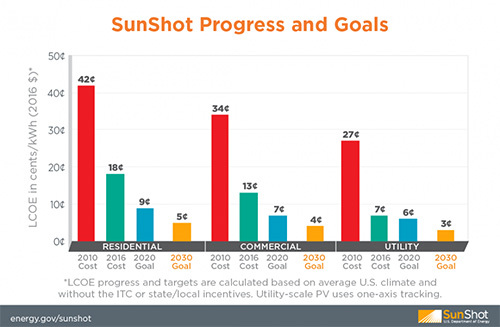 The industry has seen rapid progress in accelerating cost reductions, and in many markets there is a clear pathway to meeting the SunShot 2020 cost targets on schedule. Given this success and the potential for further innovation, the SunShot Initiative is extending its goals to reduce the average unsubsidized levelized cost of energy of utility-scale solar to 3 cents/kilowatt hour by 2030. It also aims to enable greater solar adoption by addressing grid integration challenges and market barriers. In parallel, SunShot is targeting concurrent reductions for commercial and residential rooftop solar costs to 4¢/kWh and 5¢/kWh by 2030, respectively. Achieving this goal is expected to more than double the projected electricity demand met by solar compared to the 2020 goal alone. Last year, Energy Trust published a Benchmarking Oregon Solar Soft Costs 2014 Installer Survey Analysis report showing how the cost of solar in Oregon compared to the Sunshot 2020 targets. Energy Trust is currently surveying solar trade ally contractors to update the report with current information. For more information on SunShot’s revised goals, read the press release and download the report that highlights the 2030 goals.